Ladyville cops shoot youth suspect dead! 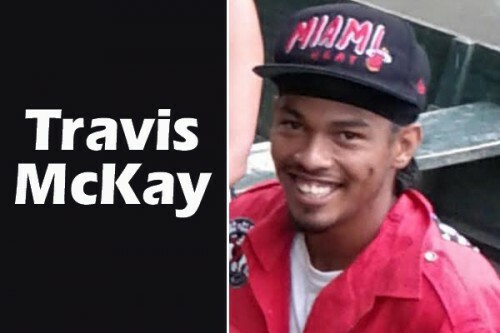 The McKay and Escarpeta families of Ladyville are tonight mourning the death of a family member, Travis McKay, 22, of Army Camp Road, Ladyville. He died on the spot after being shot in the head in a shootout with police at about 3:50 this afternoon in a yard behind the Ladyville basketball court. The official police report of the incident stated that about 3:30 this afternoon, Rafael Hernandez, 60, a Ladyville butcher, reported that while he was at his business, Belize Country Products of Mile 9 on the Philip Goldson Highway, a man ran into his business wearing a green mask, black sweater and long khaki pants, brandishing a handgun. The man then closed the door and demanded money. The thief proceeded to grab money from out the drawer and ran out of the building and across the Philip Goldson Highway into an abandoned house located beside Blue House Bar. Ladyville police who were in the area responded, continued the police release, and cornered the suspect on Seagull Street. The suspect then pulled out a .38 revolver and fired three shots at the marked police mobile unit, police said. “Police responded and as a result the suspect was fatally wounded. He was later identified as Travis Akeem McKay, 22, of Old Airport Road, Ladyville,” said the report. McKay’s body was transported to the Karl Heusner Memorial Hospital, where it awaits a post-mortem. McKay’s aunt said that she was at home when at about 4:00 she got a call informing her that Travis had been shot by police in the area of the basketball court, and that he was dead. She said that they never thought that any of their family would be shot by police, and told us that the family, devastated, did not wish to comment. Travis McKay’s death comes just five days after Tyson Rodriguez, 27, met a controversial death. Police had said that Tyson Rodriguez was a suspect in a brutal attack/robbery of an elderly Canadian married couple in Placencia on Friday, November 22, 2013. Police said that Rodriguez, with his hands handcuffed behind him, had “jumped out of their vehicle and escaped.” He was later found, police said, floating in the vicinity of Chabel Mar, about ½ mile south of the police station. According to an autopsy, however, sand was found in Rodriguez’s trachea and bronchial passage, casting severe doubt on the police’s report of how he died. Superintendent Chris Noble, the Officer Commanding Ladyville Police, said that an investigation would be conducted into the shooting death of McKay, which is routine anytime police officers are involved in a shooting and a person is killed. Travis McKay, 22, is survived by his mother, his father, a brother and a sister, his grandmother and many other relatives.